This will be our sixth year traveling to Piura, Peru for the Saint Francis Xavier Mission Trip. We will be assisting in the work of Santisimo Sacramento Parish. Assisting in the parish’s free clinic. Each missionary will have the chance to participate in a variety of different works of mercy. All the while, we form strong friendships and, most importantly, we grow in our love for Christ by serving the poor. We conclude our days with recreation, spiritual conferences, the praying of the rosary, and time for discussion and reflection. 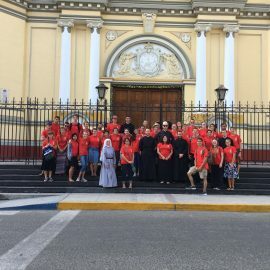 The trip concludes with a pilgrimage to visit some of the relics of Peru’s five canonized saints: St. Martin DePorres, St. Rose of Lima, St. Francis Solanus, St. Toribius de Mongrevejo, and St. John Macias. The trip will begin with a tour to the Cristobal Colon (Christopher Columbus), followed by going to the first Cathedral in the New World (America). Then we will move to the frontier, right next to Haiti to a place called Banica. There the job will be divided in two: Construction and Evangelization. Aid pastor in sacramental preparation. Assist pastor with children’s camp. – Cost: $750 This does not include any airfare. You are responsible for your airfare. Each year it is a great blessing to go to Peru on the mission trip. The idea behind such a trip is to help the less fortunate. But at the end of each trip, everyone has always agreed that they help us much more than we help them. While they might lack money, they are rich and usually end up teaching us lessons when it comes to simplicity, joy, a deep seated faith, and gratitude. That being said, after my priestly ordination, what a joy it was to be able to give them something back, to bring them the Mass and the sacraments. This mission is truly a once in a life time experience! Mass everyday, helping the poor, feeding the hungry, clothing the naked, visiting the sick...following the commands of Our Lord everyday of the trip. It has effected my life in unbelievable ways!! The people I have met on this trip, both the dear people of Peru and missionaries will remain in my heart and prayers for the rest of my life. The 2016 trip was my second year attending the St. Francis Xavier Mission in Piura, Peru, and I cannot begin to explain the immense happiness I felt upon returning. I felt at home, at peace. Being around not only my fellow missionaries but the people of Piura was so humbling, and was a constant reminder of the abundant love of God. This trip stretched me—and continues to stretch—in ways that were painful, but necessary, and I wouldn’t trade any of the experiences I had in Peru for the world. I recommend this trip to any young adult who wants to have an encounter with God through the faces of some of the poorest and most joyful people they will ever meet! My experience in Mexico was something I will never forget. I would definitely recommend anyone interested to sign up. While performing our mission work, we were able to experience the rich culture of Mexico and understand how the catholic faith has influenced many of their traditions. I very much enjoyed the mission and was impressed by the reception that we received from the people. I met other really great Catholics and made some wonderful friends among both the Mexicans and Americans who took part in the mission. It was extremely encouraging and beautiful to see the strong bond of the Catholic Faith in another part of the world. These trips have made such an impact on my life. I really have no idea where I would be in my life if I had not attended them. Amazing experience with awesome and loving people. One of my favorite memories from the Mexico Mission, was when the neighborhood children would run and jump into my arms before Catechism class every afternoon. They were eager to learn about the Faith and thrilled that Americans would help teach the classes and then play with them well into the evening. The little moments like this one were the ones when I felt a sense of charity, satisfaction and overall joy, being able to be with the children and bring the Faith to them. This year was my second time on the Saint Francis Xavier Mission Trip to Piura, Peru. This trip was such a personally renewing experience, not only for my heart, but also for my soul. I hope that one day everyone gets the chance to experience true humility by participating on a trip like this. To go on a mission trip - that is truly amazing. To go on a mission trip to Peru - that makes it even more amazing. 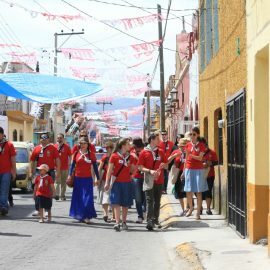 To go on a mission trip to Peru led by the Priestly Fraternity of St. Peter - there you have the best mission trip ever! With all my heart, I am very grateful to God, the FSSP priests and seminarians, and all the dear benefactors who have made these mission trips possible. I think I may have learned more from the days spent on these mission trips than in all the 18 years spent here at home. These SFX mission trips are really a great gift from God. My favorite assignment was to accompany the priest as he brought Our Lord in Holy Communion to the sick and homebound - I cannot express how deeply inspiring and beautiful this always was for me! To help bathe, groom and feed the elderly and infirm in hospice care while meditating on Jesus - that was my most cherished and rewarding experience in Peru! Mexico was definitely something that will be in my heart forever. Going on mission this past spring not only made me stronger in my faith, but also opened my eyes to what life, and the faith is like outside of the U.S. For many of those in Mexico, who were evangelizing with, their faith is what brings them together. Like one giant family. They do so much to invite as many people as they can to join in being a part of that family, and knowing that you're helping do the same, is the most fulfilling feeling. I would whole heartedly encourage anyone who is able, to go on Mission. It changes your life, and allows you to help spread your faith, make wonderful friends, and have a truly wonderful time all at once. Viva Cristo Rey! The joy I experienced while serving the poor in Piura and witnessing the strength of their faith has rekindled the fire of my soul for Christ and His church. I received much more than I could ever give, for which I am humbled. Thank you! If you have been looking for an adventure... go on a mission trip. If you are looking to refresh your soul... go on a mission trip. You might loose phone service, your nice hot showers, and might not be able to get your daily cappuccino, but you will gain invaluable insight of the universal Catholic Church, and you will be amazed how many deep friendships can develop from a few weeks, when you share the same faith and are committed to the same goals. I am certain that this trip and the persons on it will remain in my heart and prayers for the rest of my life. The 2015 Peru mission trip was a life changing experience that I will always remember. It was very eye-opening to see what poverty looks like… It means people barely living off the food they have, living in bamboo houses held up by wire, with dirt floors, not having electricity or running water, and not having a properly working toilet. These experiences certainly made a lasting impact on everyone as they learned firsthand the beauty of making a sacrifice of oneself to serve those in need. There is also something very moving about being able to connect with people of a different culture (and who live in very different circumstances) through the bonds of Christian charity. I have never seen so many happy people in my life! They have so little, yet – in a way – they have more than most Americans. I don’t think I’ve ever come home from a trip feeling so full of joy. 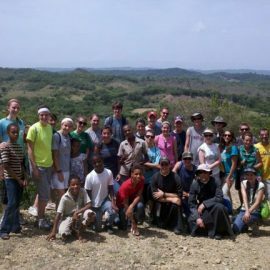 The Mission trip was mix of Mass, prayer, fun, and Corporal works of mercy. A life changing experience for me that I won’t ever forget! I had an amazing time and look forward to next year. I always like to think of mission trips as me being Gods hands and feet. From start to finish, it was one of the best two weeks of my life . . . going on a mission trip has been on my bucket list for a long time, going a second time is on my new bucket list! Meeting the missionaries, priests, sisters, seminarians, the Peruvians; the work we did, corporal and spiritual works of mercy; the fun we had . . . it was awesome!!! The SFX Mission was an awesome experience. We were able to perform all the corporal works of mercy, attend more Masses than we ever dreamed of and, on top of everything, have an absolute blast while meeting amazing new friends. Thank you for a fantastic mission Father. For me, the mission trip was by far the best 12 days of my life! Truly nothing can compare to the joy and invigoration I experienced in serving my brothers and sister in Peru. Copyright © 2017 - FSSP - All Rights Reserved.